In 2015, the Bang & Olufsen Yorkville Run raised $115,000 to support YWCA Toronto shelters. YWCA Toronto board member Alice Longhurst reflects on her experience as a multi-year B&O Yorkville Run participant and a long-time supporter of YWCA Toronto. On September 11, 2016, donors and supporters will be lacing up to run for YWCA Toronto at the 2016 Bang & Olufsen Yorkville 5K Run. To learn more and sign up to run, click here. We need your help to end violence against women and girls. A lifetime commitment to women and girls is a long-distance run. Just ask Alice Longhurst, a YWCA Toronto board member who is participating for a third time in the Bang & Olufsen Yorkville Run to benefit YWCA Toronto shelters on September 7, 2014. Alice first encountered YWCA Toronto at the age of six, when she began attending YWCA Camp Tapawingo on Georgian Bay, where she later became a counselor-in-training. Since her days at Camp Tapawingo, she has created many of her own traditions to support YWCA Toronto. A YWCA Toronto board member since 2009 and current Chair of the Toronto International Cooperation Committee, Alice enjoys her work as Manager of Corporate and Executive Education at Ryerson University’s Ted Rogers School of Management. For the last seven years, Alice’s non-profit bakery FeriaCakes (which she co-founded with friend Priya Shah) has delivered baked goods on a monthly basis to two YWCA Toronto women’s shelters. The FeriaCakes deliveries support the shelters’ monthly celebrations of residents’ successes, such as new jobs, graduations, birthdays and regaining custody of children. Alice and her loved ones are always finding ways to bond through their collective support of YWCA Toronto. Each year, she attends the YWCA Toronto Women of Distinction Awards (she sits on the planning committee) with her mother and sister to celebrate exceptional women’s contributions to our community. And this September, two of Alice’s close friends, Michelle Hunwicks and Shan Janmohamed, are proudly running alongside her for a second time in the B&O Yorkville Run held in support of YWCA Toronto shelters – Shan even placed seventh in his category in last year’s race! 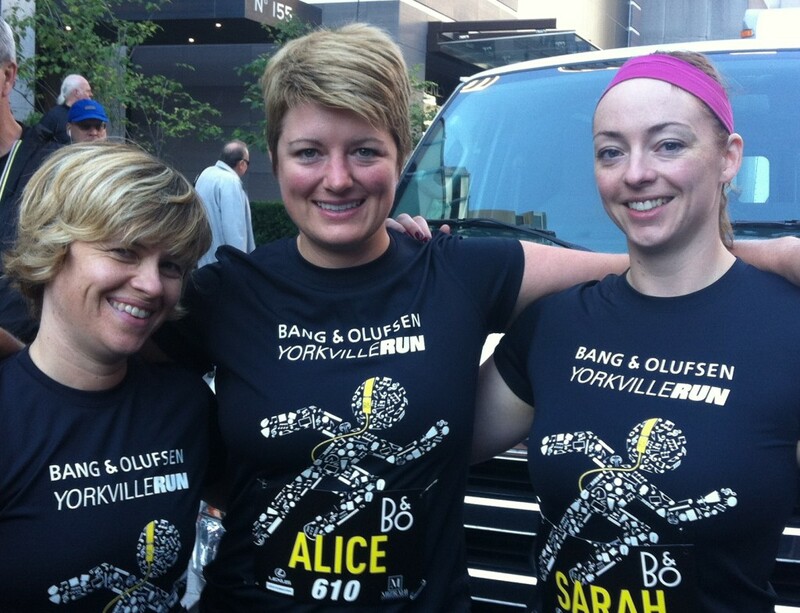 While Alice participates in several charity runs, the B&O Yorkville Run always stands out to her as an especially positive experience. For her, the B&O Yorkville Run is marked by camaraderie amongst runners which she attributes to a shared commitment to supporting YWCA Toronto shelters. She is always inspired by the presence of so many people in the streets, tirelessly pounding the pavement to help women and girls transform their lives.